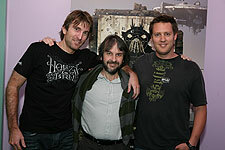 SDCC: Peter Jackson Screens District 9 ! Last evening was quite a treat as we got the opportunity to be the first to see District 9, the new sci-fi film produced by Peter Jackson. In attendance were Elijah Wood and fellow hobbit Dominic Monahan, as well as director Neill Blomkamp and lead actor Sharlto Copley, who happens to look radically different from his geeky desk worker persona in the film, opening August 14. I don’t want to reveal too much about it because going into it cold is the best possible way to see it, but I have to tell you this film was awesome. Every once in a while a great sci-fi film comes along that turns the genre on its a head. This felt like one of those films. It has great commentaries on society, cultural differences, prejudice, and other real world issues. But at the same time it manages to dish up special effects and gritty, nasty action that is unlike anything seen in recent memory. District 9 blows away Transformers: Revenge of the Fallen, no question. A full review will come later, but this film is really going to fly under the radar and knock your socks off. This is a case where the trailers and commercials have NOT ruined the movie for a change. You’re gonna love it. – District 9 was advertised as being a low budget film, but it doesn’t look like one at all. Between major CGI scenes and heavy action, this looked like a very expensive film. However, Peter Jackson confirmed it cost only $30 million. That’s astounding considering what we saw. The low cost of filming in South Africa, the use of an effects house in Vancouver for all the aliens shots, and no big name actors kept the cost down. – All the aliens in District 9 were CGI. They had some practical ones made for closeups, but they opted to go entirely CGI. – Since District 9 was low budget, they decided to cut loose on the action and get the hard R rating on the gore and killed humans. Throwing caution into the wind seems to have paid off for them. Jackson noted it was the kind of stuff that G.I. Joe: The Rise of Cobra and Transformers: Revenge of the Fallen couldn’t do as blockbusters. – The script for The Hobbit is 3 weeks away from having a first draft. Philippa Boyers, Fran, Peter, and Guillermo have been working on it. No casting has been done yet because they need to finish the script first. But they have discussed thoughts on casting. He stated that they are writing standout personalities for the dwarves and they are still evolving. He anticipated 4 or 5 standouts among them and mentioned that the actors who will portray them will have quite a physical challenge with the makeup and shooting on locations. Jackson said he had such an easy time slipping back into Middle Earth that he almost regretted handing over the directing reigns! – Jackson showed is some assembled footage for The Lovely Bones, opening December 11. He said the full trailer will be released online August 6 and will appear on prints of Julie & Julia. I wasn’t familiar with the book, but it looks like a cross between a ghost story and a murder thriller. A mix of the surreal and the suspenseful. – Jackson showed us some short films that he made in his spare time. He first showed us 2 minutes of a 10 minute film he created to test some cameras. It was a story set in WWI with tons of fighting, explosions, planes, and a tank. THIS is what he does in his spare time? It was quite impressive. He also revealed he has a passion for WWI fighter planes. He has a company that makes EXACT replicas of original planes as well as a company called “Wingnut Wings” that makes small model planes that are very detailed.